Been diving in Blue Hole? Please Vote! Coming from The Bells it is around 25 minutes of diving to reach the Blue Hole. You will find nice corals on your right hand-side and the open ocean on your left. While Macro lovers might focus their attention on the corals, nudibranches, small crustaceans on the wall, don´t forget to look to the left! Here, various species of sharks (even whale sharks), rays and dolphins might pass. Once reaching the Blue Hole, I am always again astonished by its size and darkness. The Blue Hole, Dahab, Egypt. From the outside you dive over the top of the reef at 7m depth to stare into the total darkness. Seafloor around 100m beneath you. Once you recovered from that impression you decide if you dive on the right or the left side of the blue hole back towards the shore. If you have an experienced group also the way through the middle, hovering above the darkness, might be a possibility. In 2004, 37-year-old Hungarian diver Gusztav Riczler has set a new world record for the deepest unaided scuba dive. Carrying eight cylinders with different travel and decompression mixes, Riczler reached a depth of 270 metres (886 feet) in the Blue Hole, a notorious dive site near Dahab on the Sinai coast of Egypt in the Red Sea’s Gulf of Aqaba. He descended to the maximum depth in 14-minutes, and then took eight hours for the ascent to the surface, which included several decompression stops. 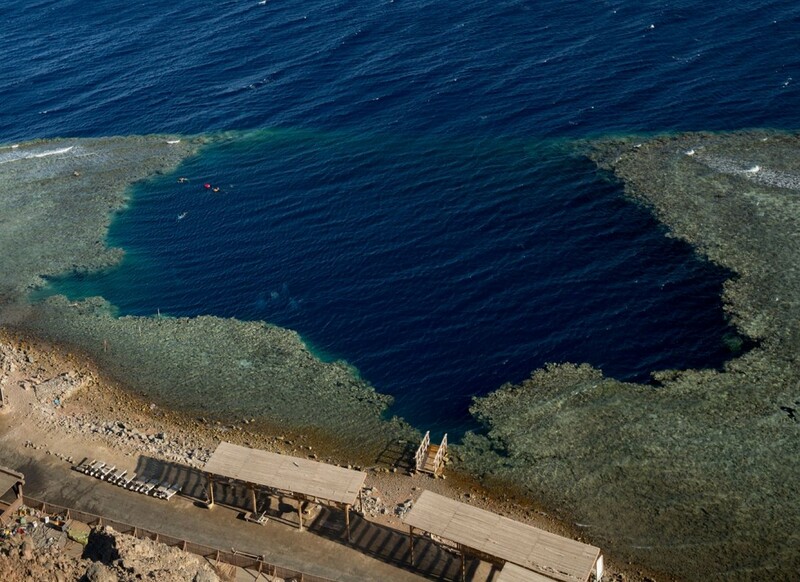 Dahab’s Blue Hole has seen several diving tragedies due to its extreme depths. A 200m diameter and over 120m deep sinkhole, nicknamed the “divers' cemetery”. Tech divers can dive down to the arches (55m+). NO single tank deep dives to the arch! Map of Dahab, Blue Hole dive site.